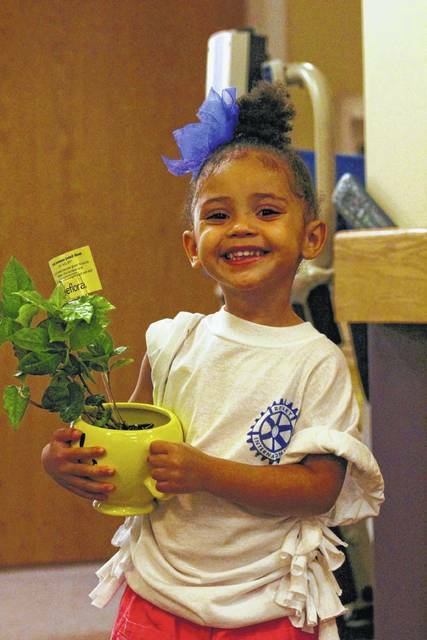 GALION — Three-year-old Miyah Powell lended a helping hand Tuesday night at Signature HealthCARE as Flower Cart Florist passed out Smiley Face coffee cups filled with flowers to residents at Signature HealthCARE and Mill Creek Nursing and Relabilitation. The national “Make Someone Smile” initiative is led by Teleflora. Toni’s Flowers in Galion also took part, passing out flowers at Magnolia Terrace and Galion Pointe. Erin Miller | Galion Inquirer Three-year-old Miyah Powell lended a helping hand Tuesday night at Signature HealthCARE as Flower Cart Florist passed out Smiley Face coffee cups filled with flowers to residents at Signature HealthCARE and Mill Creek Nursing and Relabilitation. The national “Make Someone Smile” initiative is led by Teleflora. Toni’s Flowers in Galion also took part, passing out flowers at Magnolia Terrace and Galion Pointe. https://www.galioninquirer.com/wp-content/uploads/sites/38/2017/07/web1_IMG_7228.jpgErin Miller | Galion Inquirer Three-year-old Miyah Powell lended a helping hand Tuesday night at Signature HealthCARE as Flower Cart Florist passed out Smiley Face coffee cups filled with flowers to residents at Signature HealthCARE and Mill Creek Nursing and Relabilitation. The national “Make Someone Smile” initiative is led by Teleflora. Toni’s Flowers in Galion also took part, passing out flowers at Magnolia Terrace and Galion Pointe.